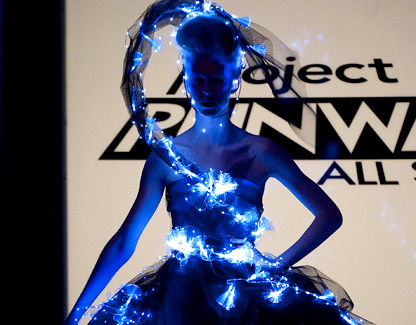 Challenge: Innovation and technology were the names of the game this week as the designers were tasked with creating an avant garde look for a runway lit by black lights. To aid them in the task, they were brought to a lighting design store to pick out lights for their designs. This challenge really pushed the designers out of their comfort zones and forced them to be extremely creative with the use of the lights and their choice of texture and silhouette. I immediately thought of Season 2 designer Diana Eng, who loved the integration of technology and fashion, and my friend Ashley Laurel, who is a guru in all things tech fashion (make sure to check out her site, Pretty-Innovative). Joanna's Hyperbole of the Week: "Well, I think this is the most avant garde—it's certainly the most electrifying—challenge in the history of Project Runway!" Since our dear Joanna (who I adore, by the way) seems dead set on making Project Runway history every week, she's getting her own weekly little category. Bless. Michael decides to go for hot pink felt, but thankfully ditches it. He unfortunately ends up just playing with tape and dancing in the black light room for the rest of the episode. "And remember, Mondo, if you don't have anything nice to say, then don't tell Kenley anything." I may hate Jerell's designs, but he knows how to crack my sh*t up. Austin takes a break from creating his "galaxy of gorgeousity" to talk to his mom, who is surprisingly a COMPLETELY NORMAL human being. How did she produce this tree nymph fairy creature? Turns out she was hit pretty hard by the recession and her house in under foreclosure. Austin tears up and, fine, so do I. Don't cry, tree nymph! The Judges: Joining Angela, Georgina and Teletubbies enthusiast Isaac this week was Pharrell Williams. Apparently he is a fashion icon and the world's best-dressed man. Sure. In any case, he promised to incorporate the winning design into one of his artist's live shows, which is a pretty cool bonus. Austin - He's the only one who didn't go in a futuristic route for his inspiration, and I absolutely love that. The inspiration of portraying the galaxy was romantic and lovely, although I don't think he hit the mark as much as the judges said he did. The headpiece and skirt needed some more volume and the lights needed to be incorporated a bit more (I loved Angela's suggestion to add more tulle over the them) in order for the design to really sparkle. Kenley - Wow! She really took this challenge and ran with it. I adored the taped plaid in the dress and the giant grid jacket (which seemed very Korto Momolu-inspired). This look was ready to walk off the runway and onto the stage at a Nicki Minaj concert. There was so much volume, but it all worked proportionally thanks to the cutouts in the jacket. I just hope Kenley continues to push herself like this in future challenges. Mondo - The tracks he created for the lights were very cool, but I couldn't help thinking that Mondo's look was just a callback to Madonna's cone bra. The bodice definitely needed a bit more shaping so the model wouldn't look quite so boxy, but he certainly had one of the most cohesive looks in the group. Jerell - Once again, Jerell took a good idea and then went way too far with it. His idea to use the movement of the fiberoptic lights was wonderful, but the end result was a model that looked like some sort of tribal bug lord. The glasses and shoes looked like a joke, and that long black skirt was a major buzzkill. Michael - Trashing the hot pink felt dress was an excellent idea, but Michael's "Plan B" didn't turn out much better anyway. I liked that the model looked like a ninja assassin, but the details did not follow through on the overall effect's promise. The puckering and overuse of the tape, the bulkiness of the shape and the ugly bow tacked on the back ruined the look. And the winner is: King of the Tree Nymphs, Austin Starlet Scarlett! Though I enjoyed the dress, I would've given the win to Kenley. This is now the second week in a row I've thought the win should've gone to her, which means I'm probably due for an appointment with a neurologist. Excuse me. Auf Wiedersehen to: Jerell, who was long overdue for an exit off the show. He is hilariously funny and makes for some great TV, but he stopped making designs worthy of keeping him on the show about six episodes ago. A unique challenge and a great runway show. Now that we're nine episodes into All Stars, it's easy to take those things for granted, but let's not forget the chaos that ensued on the runway during the previous two seasons. Soak it in, everyone, because there's only four designers left. My eye is still on a Mondo-versus-Austin finale, though Kenley has certainly been upping the ante recently. As long as Michael Costello gets eliminated soon, I think I'm alright. What do you think, dear readers? Did the designs this week make you glow with excitement, or did they leave you in the dark? Who was your favorite of the week and who do you think is the most vulnerable going into next week's challenge?